In the Paris studio of Gleyre, Monet met Renoir, Bazille, and other future Impressionists. He had some success getting his pieces into the official Salon in the 1860’s (exhibiting for the first time in 1865), but many of his more ambitious pieces were rejected. Also during his time with Gleyre Monet met Camille Doncieux, a woman of modest origins who worked as a model. They had a son together, Jean, in 1867. Monet’s family was unwilling to accept Doncieux or their child. They threatened to discontinue Monet’s allowance unless he abandoned Doncieux. Monet stayed with his family but wanted to be at the bedside when his child was born. As a result, his allowance was cut off. Unfortunately, this made life much more difficult for Monet and the three of them suffered extreme financial hardship, sometimes unable to afford food and often unable to afford paint. This led to the proud Monet attempting suicide by throwing himself into the Seine. He did not succeed and Doncieux helped him to recover both mentally and physically. In June of 1870, they were wed. That same year he submitted two paintings to the Salon, Le Déjeuner sur l’Herbe and La Grenouillère. His rejection caused somewhat of a scandal and two of the three individuals on the jury resigned. The next month, the Franco-Prussian war began. In an effort to avoid the service, his name still on the reserve list, the newlyweds took refuge in London, England. Artistically, the London years were not good for Monet. Gordon and Forge wrote that “he was not yet ready to celebrate the gray gloom of the city, but merely to describe it.” Like the Salon, his paintings were denied by the Royal Academy. Monet moved to Zaandam to continue working. In 1871 he moved back to France, near Paris in Argenteuil where he developed his impressionistic technique. In 1874 Monet joined with other artists (including Boudin, Degas, Cezanne, Guillaumin, Berthe Morisot, Pissarro, Renoir and Sisley. Noticeably absent from the group was Manet who never attended any of their exhibitions.) known as the "Société anonyme des artistes peintres, sculpteurs, graveurs”1 in creating their own exhibition. The exhibition was a financial failure and most people who went to the exhibition went for a laugh rather than a love for the art. Monet’s Impression, Sunrise was particularly scorned. One critic called this group “painters of mere impressions.”2 Another said, “The Impressionists apply paint like tongue lickings. "3 Originally meant to be derogatory; these artists took the term as a badge of honor and wore it proudly, calling themselves impressionists. In 1876 Camille fell ill with tuberculosis. Yet, in 1878 she gave birth to a second son, Michel. With his wife’s condition worsening, Monet took his family and moved in with the bankrupted Hoschedes in Vetheuil. It was a terrible time for Monet, in addition to his wife’s deteriorating condition, his paintings were doing poorly. He sold 16 paintings for 200 francs each. Giving birth to a child probably did not help Camille’s frail condition and she died a year later on September 5. 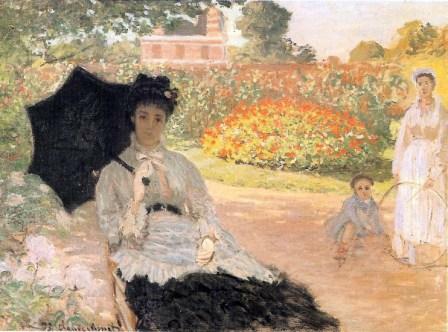 Claude Monet was extremely depressed following her death; he even painted Camille on her death bed. This depression drove him into his painting and he became determined to create masterpieces.